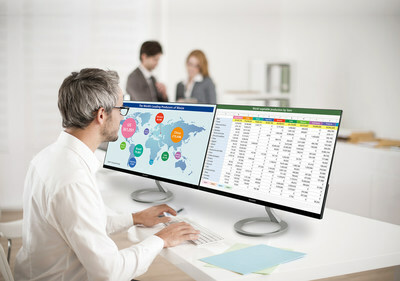 MONTVALE, N.J., Jan. 15, 2019 /PRNewswire/ -- Sharp Imaging and Information Company of America (SIICA), a division of Sharp Electronics Corporation (SEC), today announced three new space-saving desktop monitors for the modern, compact workplace: the 22" Class (21.5" diagonal) LL-B220, 24" Class (23.8" diagonal) LL-B240 and 27" Class (27" diagonal) LL-B270. "As we transition from fixed offices to shared workspaces, users will need more space and flexibility, particularly with how they use their desktop monitors," said Gary Bailer, Director of Product Planning and Marketing for Pro AV Products at Sharp Imaging and Information Company of America. "With an ultra-thin profile and elegant design, Sharp's new desktop displays are designed with these changes in mind and will be an integral part of the workplace of the future." *Results based on PMA Research, the large screen displays experts, U.S. Distributor Flat Panel Tracking Service report, February 2018. Results are not an endorsement of Sharp. Any reliance on these results is at the third party's own judgement and/or responsibility. Visit pmaresearch.com for more information.